(2) The water that has decreased in volume, due to the evaporation effect, will be replenished with the same water that has evaporated to the surface. In virtue of such assumptions, it's reasonable to assert that the water temperature doesn't undergo any variations along with the different layers of the water itself. The amount of evaporated water at the surface of contact between the two fluids, air, and water, depends on the speed of vapor diffusion, that was created from mixing vapor-air. This is located near the interface between the two fluids. In a volume containing a mixture of several different gases or vapors at a given temperature, the value of the total pressure is the sum of the pressures, where each of the gases or vapors in the mixture components would have exerted separately. If by itself, it would occupy the entire volume. In other words, each gas in a mixture contributes with its partial pressure to the total pressure, as if acting independently from all others. For example, the evaporation of water in an environment containing air continues to take place until the vapor produced reaches the required amount to fill the available volume and thus arriving at saturation, at the specific temperature of the environment taken under consideration. The produced vapor exerts pressure as any other gas; this pressure is called vapor pressure and its value depends only by the fluid temperature. For this reason, the total pressure reached in the container – by which the determined temperature was reached, assumed constant, vaporization stops - at that determined temperature it exceeds the value of the initial pressure by an amount equal to the saturated vapor pressure. Working at normal atmospheric pressures, Dalton's law of partial pressures finds the exact experimental results. The vapor tension or pressure of saturated vapor on the water surface has the same value of saturation pressure (psat) detectable at water temperature (tL). Tool to build and/or verify evaporative cooling tower's performance. Click Neri Calculator to try 50 free calculation for 1 day! Filling material for evaporative cooling towers. Try our Neri calculator tool for free. When you sign up, we offer you a 1-day free trial of 50 calculations. 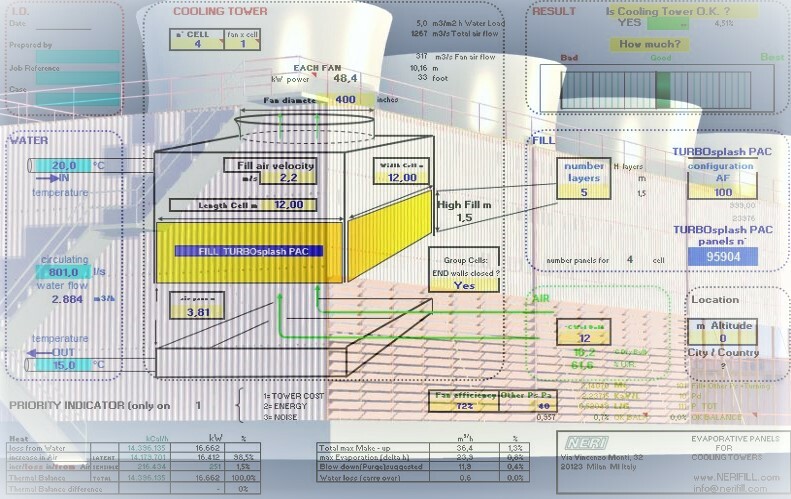 This useful and easy program let you quickly and securely perform calculations for the design of a new cooling tower project, upgrade the performance of an existing counter-flow tower and verify its efficiency and working conditions. It works with all types of cooling towers and with different types of fill (splash or film). The calculating program, besides covering the whole range of TURBOsplash PAC ® TM fill material, it's also suitable for calculating "FILM" material channels 12,19 and 27 mm. For your free 1-day trial, click here to go to the calculating program NERI Calculator for Cooling Towers. After using the program, please go to our Contact page and send us any questions and/or comments about your experience using the tool. We greatly appreciate your feedback. © TURBOsplash PAC ®™. Simple theme. Powered by Blogger.